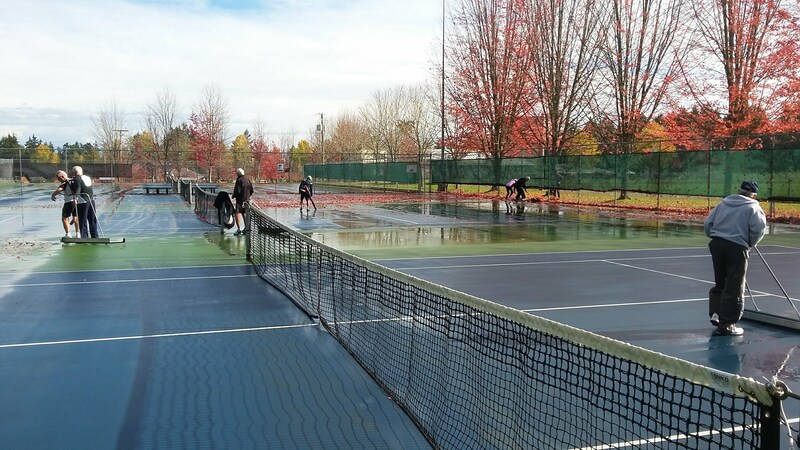 The Club is fortunate in being able to use five of the six excellent community courts behind the Springwood School in Parksville and two of the three scenically situated courts on Veterans Way in Qualicum Beach. The times at which the Club has courts reserved in both Parksville and Qualicum Beach are listed under the Schedule tab. Play at these times is on a drop-in basis and tends to be doubles. In the evening, play is either singles or doubles. During the summer season, in addition to the daily drop-in tennis, the Club organizes a number of social events and tournaments for singles, doubles, and mixed doubles. 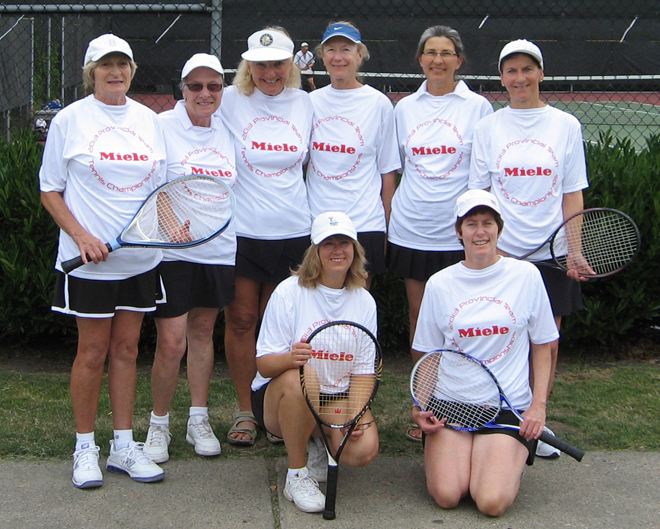 Benefits of joining the Club include drop-in play, Round Robin mixers and other tournaments, social events, online reservations for some courts, a program for juniors, and use of club equipment like a ball machine. The annual club membership fees are $35 for adults and $20 for juniors (under 18 years of age). Members receive a club shoe tag, which allows them to play at the times reserved for our Club. (See Schedule.) The membership year runs from January 1 to December 31. New members have to pay the Club fee for the year at the time they join. Continuing Club members have until the end of April to pay the annual fee. Monday, Wednesday, Friday: Courts 1 and 2, 9:00 am - noon, pre-aranged games. Monday, Wednesday, Friday: Courts 1 and 2, 9:00 am - noon, pre-arranged games. Court Etiquette. All members should show courtesy and consideration while on and off the courts. Reserved Court Times and Club Tennis. In the Court Times table above, the fields with a white background indicate the times at which the Club has reservations at Springwood. Text in these fields indicates scheduled tennis activities during those times. While all Club scheduled activities take place during these times, some Club members make private arrangements and play at other times. The Club's main scheduled tennis activities are the Open and Intermediate sessions at Springwood shown in the table above. For details on these activities, see Scheduled Activities below. You will notice that some of the activity names in the table are underlined. This means they are links. Clicking on a link will allow you to sign up for the event, but signing up is required only for the Reg'd Mixed and the Shootout activities. For details about signing up, see the following Sign-up entry. If you are not sure which activity to attend, please see Scheduled Activities. Play during reserved times is drop-in most of the time as explained under Scheduled Activities below. There will be a Social Tennis Group in May on Tuesdays 10 - noon. This is not a drop-in activity. The group will be organized by Ada Sarsiat and Renee Guenette. If a volunteer can be found to organize the activity in June, the Social Tennis will also be happening then. To join the group, members should send an email to Ada Sarsiat, and she will add their names to the weekly player schedule. The play is non-competitive mixed doubles. Each session comprises a warm-up period followed by three 35-minute matches. Eeach match is played with a different partner assigned in advance by the organizer. You do not need a partner to join the group. This is an excellent group activity for new members to meet and play with other Club members in a series of friendly social matches. Sign-up. The underlined entries in the Court Times table are links to pages on which you can sign up for these events, or cancel if you have already signed up. You must be a Club member to be able to sign up. If you sign up, you are expected to be on the court promptly at the beginning of the sign-up period. Otherwise, you will forfeit your reservation. Signing up is required for the Registered Mixed Doubles on Saturday and the Singles Shootout on Friday. However, signing up can be useful for all events in several ways, e.g., when only few players are expected as for some Open times or when the weather is uncertain. Players playing doubles change courts after completing a set. For more about court changes, see below. Intermediate, MWF 12:20-2:30, Courts 2 - 6. Play during this period is for players at the intermediate level or above (3.0 or higher on the USTA Ranking Ladder), women, men, and juniors. The 12:20-2:30 period is divided into a 10-min warm-up session from 12:20-12:30 and three 40-min play sessions. Players change courts after each 40-min session as explained in more detail below under 'Court Changes'. Play is doubles if possible. If there are two or three players on the last court, they might want to play singles or Australian doubles, respectively. If only a single player is extra at 12:20, s/he is to be folded in on one of the other courts. The same applies if a single player is waiting at the 40-min change points. Players who show up during a 40-min session have to wait until the start of the next session to be folded in. Up to 20 players can sign up for the 12:20 - 13:10 period. The signup system will put players onto Courts 6, 5, etc. Beginning at 13:10, players will change courts as explained under 'Court Changes' below. It is expected that players who sign up for the Intermediate Tennis will stay for all three 40-min play sessions even though they can sign up for only the first session. Otherwise, the court changes will not work well. Players who have not signed up will play on any courtsthat are not full. Registered Mixed Doubles, Saturday 10 - 12. Courts 2 and 3 are reserved for registered mixed doubles. The remaining courts, 4-6, are for Open play. During the Registered Mixed Doubles session, teams stay together during the entire 2-hour session, but change courts after completing a set, similar to what is done in the Open sessions but without breaking up the teams. Players must sign up for this event. Singles Shootout, Friday 2:40 - 4:00, Courts 2 - 6. The Shootout is competitive play at the 3.5 level and above. For a definition of the USTA ranking levels, click on the link in the preceding sentence or look under Links on this website. Up to 20 players can sign up for the Shootout, but only the first ten to sign up will actually get to play because we have only five Courts available, Courts 2 - 6. If more than ten sign up, they will be on the waiting list and the first ones on the waiting list will be moved up into the player list if one or more of the first ten people who signed up cancel. If fewer than ten players are present and their number is odd, the three players on the lowest court will play Australian. The sign-up program sorts the first ten players according to their scores on the previous Friday and will place them on Courts 6 to 2, in that order, at the start. Players who did not record a score or who did not participate on the previous Friday, will be sorted in the order in which they signed up below the players who recorded a score. Players can record their scores (total number of games won on a given Friday) on the website after completing play. A score can be recorded anytime before play begins the following Friday. Details on the organization of the Shootout. The Shootout starts punctually at 2:40 pm with a a 10-min warm-up followed by three 20-min sets, with 5-min breaks in between. Players are expected to play all three sets. Different players may participate each Friday. It is first come first served on the sign-up system. During the 5-min break at the end of a 20-min set, players change courts as in the Intermediate Tennis events. The warm-up period includes warming up the serve for 2-3 min. Play begins with a regular serve, i.e., no 'first-ball-in' play. A set consists of continuous play of games during a 20-min interval. The final score in a set might be 5:2 or 7:4. If a serve touches the net and is good otherwise, the point is played out. There is no let call. No-ad scoring. If a game reaches deuce, only one more deciding point is played. The receiver chooses the side from which the ball is going to be served. 3.5/4.0+ Doubles Ladder, Tuesday and Thursdaday 6-8 pm, Courts 4 - 6, from May 7 to mid-September. Courts 4-6 at Springwood are reserved for this activity which is for members at the 3.5/4.0+ level. Loren Guenette is the coordinator. You can contact him at ldguenette@shaw.ca. Players must be members of the Arrowsmith Tennis Club (annual fee: $35). All play is doubles. Ladder play is spread out over two days, with Court 4 on Wednesday being the lowest rung of the ladder and Court 6 on Monday being the highest rung. It is expected that play on Monday will be predominantly at the 4.0+ level and play on Wednesday predominantly at the 3.5+ level. Players move up and down the ladder as described below. Note: Should you wish to try this doubles ladder, please contact Loren who will place you on the list or sub list. Play is not drop-in. Instead, players will be informed each week by email of who is playing on which court based on last week's performance. Although play is doubles only, scores are kept for individual players. If a participant cannot play on a given day, a player from the sub list will take his/her place. On each court, the four players pre-selected by the Organizer for that court will play three four-game 'sets' using no-ad scoring. Each player serves once in a set. Each set is played with a different grouping of players so that every player plays once with every other player in the three sets. A player gets one point for each game won so that s/he can earn a maximum of 12 points in the three sets. The three sets will require not more than an hour. After the first hour, the two players with the most points move up one court, the other two players move down one court. The two players with the most points on the top court and the two players with the fewest points on the lowest court stay on those courts. In the second hour, three more sets are played with the same rules as during the first hour except that the two players who finish with the lower score on the bottom court (Court 4) on Monday will start on the top court (Court 6) the following Wednesday. Likewise, the two players who finish on the top court on Wednesday night will start on the bottom court the next Monday. Should there be a three-way tie for either the highest or the lowest score after three sets, a racket spin will determine who is the top or bottom player, respectively, while the other two players play a first to 5 points singles to see who will go down with the lowest or up with the higest scoring player, respectively. Should there be a two-way tie in points between the second and third player, they will play a 5-point singles to see who goes down with the lowest scoring player. If the score reaches 4 to 4 in a 5-point singles, a one-point tie breaker is played. The player serving the 5th and final point serves to the ad or deuce court as selected by the receiving player. The two players with the lowest score on the bottom court at the end of the two hours on Wednesday may be placed on the sub list, depending on the number of players available the following week. If a player is unable to participate in a given week and replaced by a player from the sub list, s/he on their return will take up the position reached by the sub list player. The objective of the ladder is to get to and stay on the top court. Open. Courts are changed at the end of a set, by calling 'Court' after completing a set. If the other courts are still in the middle of a set, the players on the court on which a set has been completed will start a new set, but stop and change courts as soon as a set is completed on another court and 'Court' is called. Intermediate. Courts are being filled from Court 6 on downward punctually at 12:20. At 13:10 and 13:50, players change courts. During each 40-min session, play is continuous regardless of the score so that the score at the end of a session might be 8:5. At the end of a session, the team with the higher score moves to the next higher court and the team with the lower score to the next lower court, except that the team with the higher score on Court 6 will remain on that court and, similarly, the team with the lower score on the lowest court will remain on that court. Team mates in one session will split up and be on opposite sides of the net in the following session. After this player exchange and before beginning the new session, any extra players (1, 2 or 3) who are not part of a complete foursome get folded in as follows. First, gaps are filled that might arise if players drop out at the end of a session. If after filling all gaps extra players remain who need a spot, they should change places with the lower-score players on the lowest court. If necessary, it will be decided by spinning a racket who has to step aside for the next 40-min period. If gaps are remaining on more than one court after all extra players have moved in, the courts with gaps will consolidate so that at most one court with fewer than four players remains. It makes for more enjoyable tennis if the players on a court are matched. Players are encouraged to keep this in mind when teams are arranged. Drop-in Play. Play is on a drop-in basis for all categories, except the Registered Mixed Doubles, the Shootout, and the Sign-up sessions on MWF 12:20-13:10. From May 6 through June 23, Monday - Friday, the Springwood School may occasionally require Courts 1 - 3 for tennis lessons. The School has priority on the courts during those times. From July 8 to August 16, Courts 1 - 3 are reserved for the RDN Summer Tennis Camp from 9:00 until 12:15. Ball Machine. The Club has a Silent-Partner ball machine which is being kept in the Club's storage room. All Club members (juniors only under supervision of an adult Club member) are free to use the machine if they are familiar with its operation AND the Club's rules for using it. Let somebody who has used the machine before explain it to you and/or consult the operation manual for the machine. The machine, if used improperly, can cause severe injuries. When the machine is ON, ALWAYS watch the balls coming out of the machine and NEVER stand directly in front of the machine. The machine can fire balls at 95 mph or 152 km/h! The ball machine is to be used on a first-come first-served basis. You are requested to sign the log book that is with the machine when you use the machine. At all times, ball machine use has lower priority on a court than regular tennis play by either members of the public or the Club. The ball machine should not be used when the courts are wet. Wet balls clog up the mechanism. 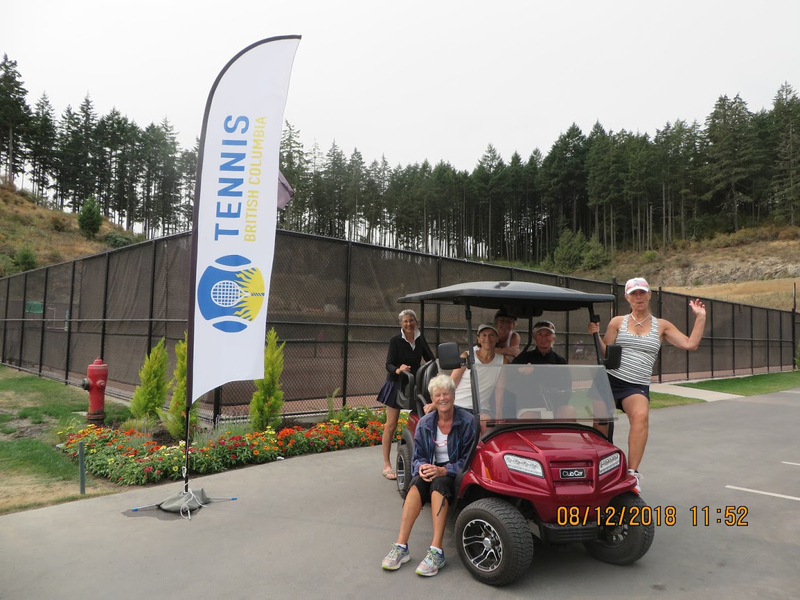 In addition to the regular tennis activity, listed under the Schedule tab, the Club organizes a number of special events: round robins, tournaments, social events. Some of these are free for Club members, others require a small fee. Except for the tournaments, these events are listed below. Listed here are also the date and time of the End of Season/Awards Dinner and of the General Annual Meeting. The tournaments are listed under a separate Tournament tab. Saturday, April 13, 10:00 - noon: Season Opener. This new event is held to welcome new and returning members, with tennis, coffee and light refreshments. Saturday, May 4: Round Robin. Note about all Round Robins. They are played on the Springwood Courts, start at 9:00 am and last until about 11:00 am. Please be at the courts by 8:45 am to register and to allow the organizers time to schedule the play order. Participation is free to all members. Three rounds (or possibly more, depending on participant numbers) will be played, 8 games in each round, with a reshuffling of players within each group of four after 4 games. For the detailed Round Robin Rules, click here. In the case of rain for a Round Robin, the event will be canceled and not rescheduled. Light refreshments (juice, cookies, chips) will be served at all Round Robins. Saturday, June 1: Round Robin. Saturday, June 22: Round Robin. Saturday, July 6: Round Robin. Saturday, July 20: Round Robin. Saturday, August 3: Round Robin. Saturday, August 17: Final Round Robin. Starting in the last week of April 2019 annd continuing through much of September, the Club has tennis for juniors (age below 18) every Tuesday from 3:30 - 5:00 at the Springwood courts. Registration and the annual junior membership fee of $20 can be paid on the first day, Tuesday, April 30. Players can join at any time. We welcome the parents' participation. One or more adult Club members will be present to assist, organize games, and give hints on play. For more information, please call Jill Trelawny at 250-954-3474. Juniors may also participate in the Club's other regularly scheduled tennis activities as listed on the website under Schedule and in special events like Round Robins and Club tournaments as listed under Events and Tournaments. The 2018 tournaments are listed below. The 2019 tournaments will be listed in April 2019. Saturday, June 16: ATC Oceanside Open Tournament. Men's and Ladies' doubles. This event is open to all comers, members and non-members. Fee: $10/participant. The fee includes prizes, refreshments and lunch. The tournament format will depend on the number of participants. The registration deadline is Wednesday, June 21. To register, email Don Lefler. Saturday, July 28: ATC Mad Hatter Mixed Doubles Tournament. You sign up individually. Participation is limited to twelve ladies and men each. Play starts at 9:00 am and will continue until about 1:30 pm. To sign up for the tournament, click HERE or email Don Lefler. Don will transfer your name to the online sign-up list so that this list is a complete list of registrants. The deadline for signing up is 7:00 pm on Wednesday, July 25. If bad weather forces the event to be canceled on Saturday, the event will be rescheduled for Sunday, July 29. There will be a refreshment break, and a light lunch will be served. Mon, Aug 20 to Sat, Aug 25: ATC Club Championship Tournament With BBQ. Ladies' and Men's Singles, Ladies' and Men's Doubles, Mixed Doubles. Matches begin on Mon, Aug 20. Finals will be played on Sat, Aug. 25. Entry fee: $5 per person and event. To register, please contact Don Lefler or Greg Bach by Aug 16, 19:00 h. The tournament format will be determined by the number of entries. Entrants will be contacted by Sunday. Trophies will be awarded on the final Saturday at the conclusion of play and food will be provided. Click HERE to see the up-to-date membership list with phone numbers and some email addresses. If you wish to have your email address added or deleted from the list, please call Hans Laue (250-594-1786) or Sue Rehill (250-947-9743). Click HERE to see or download the most recent Newsletter and earlier ones. Most of our members are now being contacted by email. Please contact Jim Cameron at arrowsmithtennis@hotmail.com if you have email and are not being contacted in this way or if you are changing your email. You can also contact Jim about any other Club matters by using the email address above. 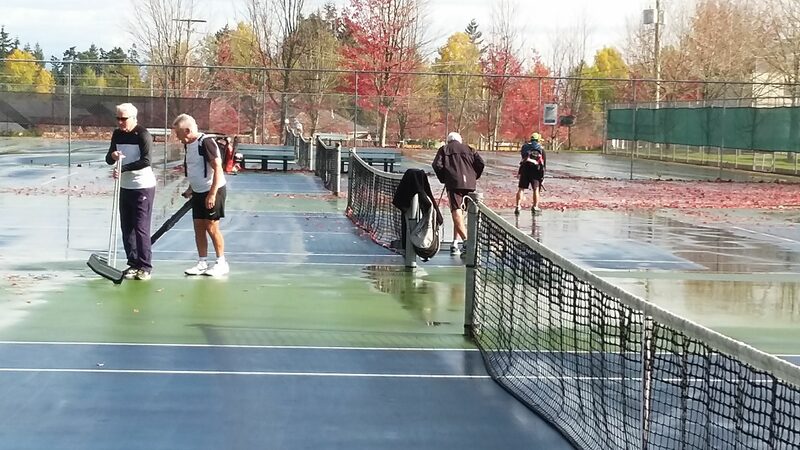 Throughout the year, but especially in the fall, leaves and needles need to be cleaned off the courts. The Club is assisting the City in this task and is asking for volunteers who together with others will help maintain the courts in good condition. Paul Arnell (email) will coordinate the activity. To sign up for a two-week period, click HERE. A leaf blower, brooms, garbage can, and squeegees are available in the Storage Room at courtside. Ask a member of the Executive for the key combination. Sue Wilson is our Sunshine Person. Ph: 250-248-7280. Please let Sue know if someone is ill or if there is a bereavement in the family, so she can send a card. John Suttie, a member of our Club, will string your racquet. You can contact him at 250.487.7532 or jdsuttie@gmail.com. Murray Hough (250.753.0048) is an experienced racquet stringer who lives in Nananimo. Alan Oslie (250-954-0471) is a member of our Club with experience in coaching juniors and adults, including our juniors and beginning adults who may become Club members. He is available for private and small group lessons at times to be mutually agreed. Give him a call. Gordon Verge is a qualified instructor. Call Gordon at 250-594-2000 for single or group rates. Ball Machine. The Club has a Silent Partner - Edge Star ball machine which is available to all members (juniors only with supervision of an adult member). Members must have received instruction on how to use the machine before using it for the first time. Contact Paul Arnell at 250-729-1271 for instruction. For information about the machine, click User's Manual. The Springwood School parking lot must NOT be used by tennis players during school hours. 1975 - The Qualicum Beach Tennis Courts were built. Louise Dwyer was on the Recreation Commission and instrumental in pulling together the funding by means of a of 1/3 Town, 1/3 Rotary, and 1/3 Provincial grant. 1978 - The Qualicum Beach Open Tournament was started. 1983 - The Arrowsmith Tennis Club was formed with Fran Jones as the first president and Meep Verbrugge as a major organizational force. 66 members. The Club was based in Qualicum Beach with some play at Ballenas High School. 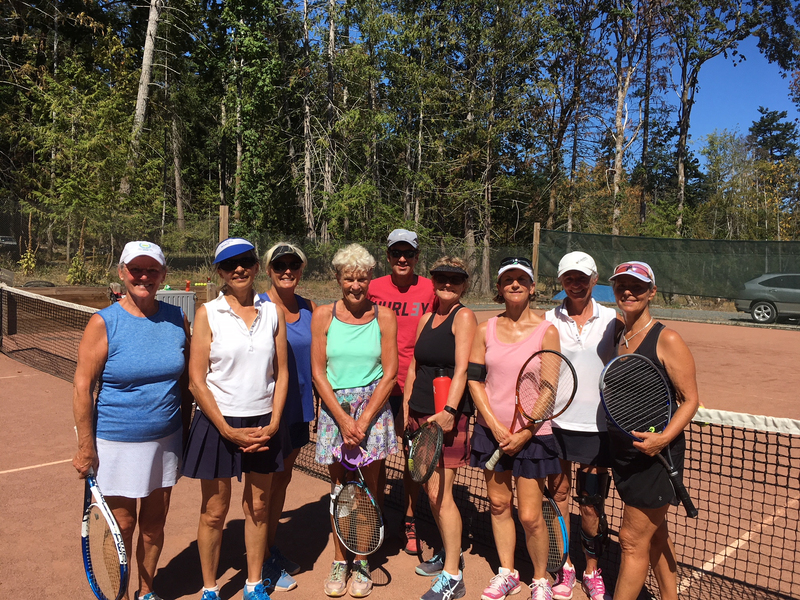 There were a morning of ladies only, a fun day of mixed play, and a singles ladder. Some current members, Christine Aubin, Louise Dwyer, Jim Henderson, George Klimek, Stan Saunders, Rita Stevenson and Dorothy Watson, were among the original members of the Club. 1984 - Presidents Betty Gerbracht and Louise Dwyer. 43 members. 1985 - 1989 - President Jim Martin (35, 68, 34, 56 members). 1990 - President Noel Edwards, 65 adults, 5 juniors. 1991 - President Judy Wood, 128 adults, 38 juniors. This was the first year in which there were tournaments for Club members only - juniors, adults, and seniors (over 55). These tournaments attracted many new members. The junior boys tournaments had under-14 and under-18 events and attracted 24 in singles and 14 pairs in doubles. There were singles and doubles ladders, regular round robins (at Beach Acres). New also was an "Open" junior tournament, with other clubs attending. The Club was incorporated. 1992 - President Judy Wood. 114 adults, 57 juniors. There was an opening junior tournament at the beginning of the season in May and a final junior tournament which attracted 36 entries including 9 girls. 1993 - President Kathy Sturrock, 125 adults, 41 juniors. Judy Wood organized a Ladies B Interclub league. 1994 - President Kathy Sturrock, 114 adults, 40 juniors. Casino night raised $11,000 for new courts. The Ladies B Team won the island championship. 1995 - President Frank Scott, 114 adults, 6 juniors. The first "I Can't Believe I Won This Trophy" mixed tourney was held. Judy organized a fall mixed Interclub league and Arrowsmith won. The "Open" Junior ceased. 1996 - President Robert Stovall, 117 adults, 10 juniors. 1997 - President Robert Stovall, 94 adults, 2 juniors. Club casino raised $14,000. 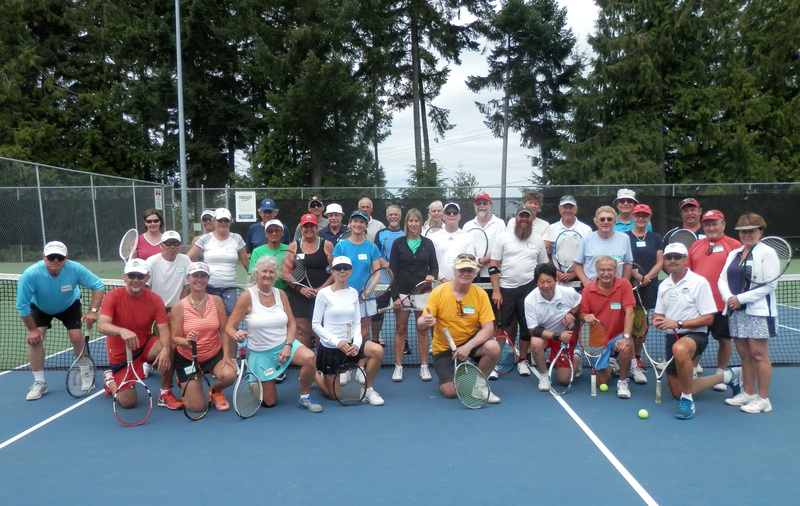 The Club offered $30,000 to Qualicum Beach toward building new courts - declined. The Mixed Team won Mid-Island league. 1998 - President Glenn Simpson, 100 adults, 8 juniors. 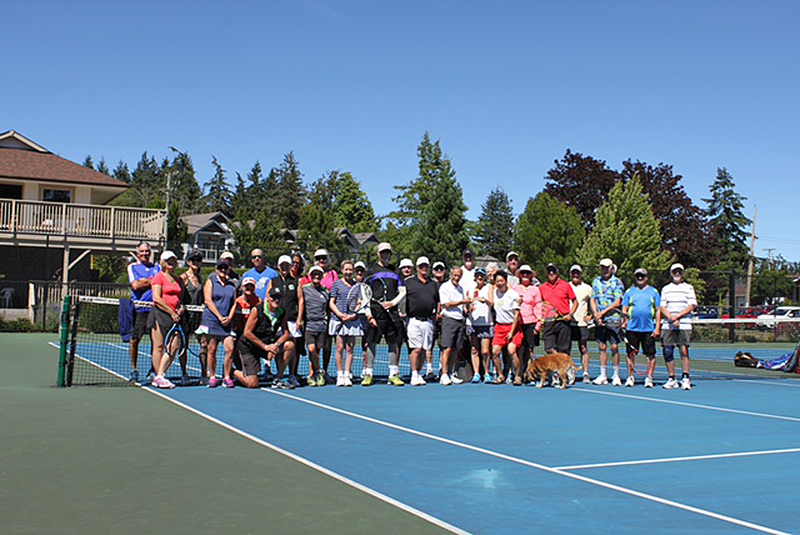 The Club contributed $34,550 toward the addition of three courts at Springwood in Parksville, with the proviso that the Club get preferential use of court time. The final round robin was played on the six Springwood courts October 18. 1999 - President Glenn Simpson, 93 adults, 8 juniors. The Club times of Tuesday, Thursday, Saturday and men's Sunday mornings were moved from Qualicum to Springwood and the fees raised from $20 to $25. (A few members preferred not to move and formed a Qualicum Club). The Qualicum Open became the Arrowsmith Open and moved to Springwood. The Mixed Team won the Mid-Island league. A second ladies team was entered in the Interclub league. 2000 - President Bruce Pepper, 108 adults, 1 junior. 2001 - President Louise Dwyer, 107 adults, 7 juniors. Gordon Verge started junior strategy sessions. The Mixed Team won the Mid-Island league. 2002 - President Louise Dwyer, 126 adults, 7 juniors. A club e-mail account was set up to provide improved communication with members. The Ladies B Red Team wins the Mid-Island league. 2003 - President Bob Urquhart, 120 adults, 21 juniors. A storage shed was built at Springwood at a cost of $4450. The website was developed to better publicize Club activities. The Ladies B Red Team won the Vancouver Island championship. 2004 - President Bob Urquhart, 128 adults, 18 juniors. Due to organizational difficulties, the Arrowsmith Open tournament was canceled, effective starting 2005. The Interclub mixed and ladies leagues too ceased due to the lack of an organizer. Future emphasis is being placed on tournaments for members only. 2005 - President Liz Court, 123 adults, 25 juniors. 2006 - President Liz Court, 118 adults, 23 juniors. 2007 - President Ron Morrisroe, 113 adults, 19 juniors. 2008 - President Ron Morrisroe, 112 adults, 19 juniors. 2009 - President Bob Sage, 117 adults, 19 juniors. 2010 - President Bob Sage, 108 adults, 8 juniors. 2011 - President Dave Chappell, 121 adult members. In Winter 2011, four indoor tennis sessions at the Westwood Club were arranged for 12 participants. A rebound net for practice hitting was installed against the fence on the north side of Court 2. 2012 - President Hans Laue, 123 adults, 1 junior. Westwood indoor play was again arranged in the winter months. Wind screens were added to the south fence. A new court allocation system for the Round Robins was introduced. 2013 - President Hans Laue, 122 adults, 19 juniors (the Club's Junior Program was restarted under Jill Trelawny), Westwood indoor winter tennis continuing, MWF 12-2 sessions restructured (for somewhat more challenging play with both men and ladies participating, starting punctually at noon with court changes every 40 min), online sign-up system introduced for the MWF 12-2 and the evening sessions, our ladies team won the 3.5 mid-Island Interclub League and placed second in the Miele Provincial Tournament, a squeegee that really works was acquired and a keypad lock installed on the locker room to give all members access to court cleaning equipment. In September 2013, the City installed new nets on Courts 4 and 6. 2014 - President Frank Johnston, 116 adults, 24 juniors (the Club's Junior Program continued under Jill Trelawny), Westwood indoor winter tennis continuing, the ladies' team again won the 3.5 mid-Island Interclub League and got to compete at the Miele Provincial Tournament held at Whistler, and a second of the good squeegees was acquired. Fees were raised from $25 to $35 for adults and from $5 to $10 for juniors. Have a look at photos taken at recent Club events by clicking on the links below. Compass Mixed Tournament, July 19, 2014. Ladies Interclub Champs, Spring 2014. Round Robin on June 7, 2014. Miele Ladies Team Championship, Richmond, BC, August 10-13, 2013. Round Robin on July 6, 2013. Round Robin on June 1, 2013. Round Robin on May 4, 2013. Click on any of the following links for more tennis information.